Learn about SmartArt graphics in PowerPoint 2010. SmartArt graphics are essentially diagrams based on logic or relationships. First introduced with PowerPoint 2007, SmartArt has been improved in PowerPoint 2010 (and Office 2010). Using a combination of simple shapes and text, SmartArt can be more effective in expressing information than plain bulleted text. 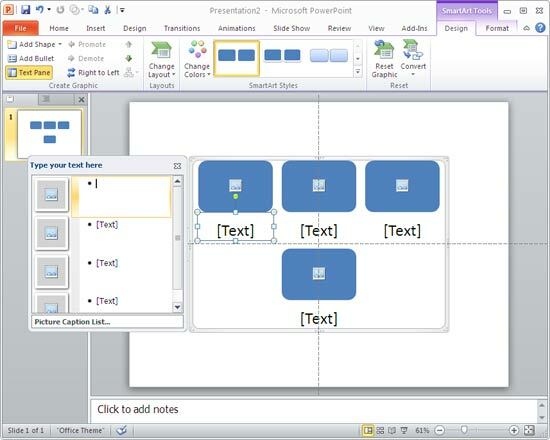 Create a new presentation in PowerPoint 2010, or open any existing one. Navigate to the slide where you want to insert a SmartArt graphic. Select the Insert tab on the Ribbon, and then click the SmartArt button as shown in Figure 1. This summons the Choose a SmartArt Graphic dialog box (see Figure 2). Choose any of the SmartArt graphic variants, and click the OK button to add it to the slide. This places the selected SmartArt graphic on the slide as shown in Figure 3. Replace the dummy text with the text that you want to use. The SmartArt Tools Design tab (see Figure 4) allows you to add and reorganize shapes within a SmartArt graphic. You can also change the layout, color, and styles and reset the formatted SmartArt to its default state. 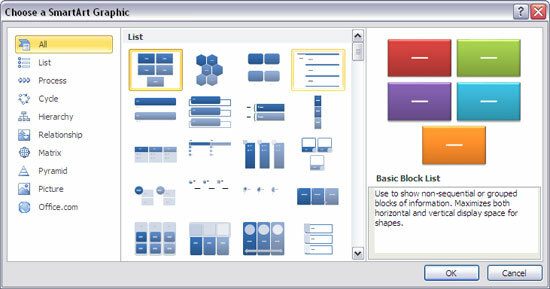 The SmartArt Tools Format tab (see Figure 5) lets you change, enlarge or reduce the size of the shapes, apply Shapes Styles, format text and also rearrange the shapes.